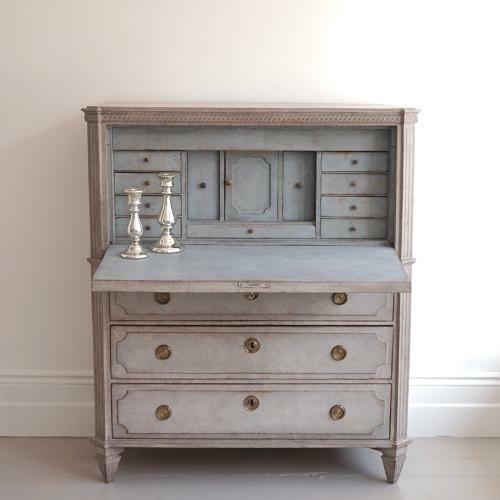 A superb 19th century Gustavian style drop-front bureau in a beautiful warm grey patina. This rare cabinet has canted & fluted corners with a scrolling trim to the top pediment, a decorative inset panelled desk lid with convex corners, over three drawers with raised panelled fronts with scalloped corners, and square tapered & fluted feet. The stunning pale blue interior comprises of twelve drawers and compartments, one of which conceals a secret section. Original locks and hardware. Swedish circa 1870.